The Chinese calendar uses a twelve year cycle, each marked by an animal. Those born in the year are then described as having certain traits similar to the animal. When a new year rolls around, apt proverbs and jokes are tossed about. 2014 is the year of the horse and I learnt a new favourite proverb:马到成功 (success is imminent once the horse arrives). You see, I was born in the year of the horse - and ain't it grand that my arrival at any scene would herald impending success! But i got to thinking about all the horse-related experiences in my life, and to a passage of Scripture that really helped me. My first flight and my first mission trip. We flew into Thailand headed for the mountain tribes. Most of us had not trained for those mountains. There were supposed to be horses at the foot to help us carry stuff. But we were late, too late. So we had to trudge nearly five hours up the mountains with our puppets, guitar, bags and tired bodies as a gentle rain fell all about us. We slipped in the mud, we gave up many times even as the guide egged us on with her limited Chinese, saying repeatedly, "another few minutes". We city dwellers had no idea. But how I longed for those horses! We never saw them. We came back down bumping all the way on the back of a truck which at one point got stuck in a muddy ridge and we all had to get off and shove. I am not sure if my thesis supervisor picked up that I have referred to him as a footman; but my youthful zeal knew little bounds back then - upwards and onwards I was going to go! This time, i finally rode one; and nearly died! With two friends in New Zealand, we found our way to a hill where there was horse riding. The young Kiwi gal who ran the place sized us up and led us off to our horses. After a few brief introductory remarks, we found ourselves atop a horse each. Mine was a black stallion with a large bulgy stomach. Its name was Inky. We set off slowly and winded around the trail. Inky however had other ideas. It could undoubtedly pick up that I was a wimp (horse language for she doesn't know how to ride) and repeatedly veered off the trail to satisfy its love for far-out grasses growing at the edges. I was talking, coaxing, reining in...to little avail. After a nerve-wrecking hour, I dismounted and fell to the ground, my legs all gone soft and my groin in pain from straddling that fat tummy. My love for this majestic creature wouldn't wane it seems. How many silly Inkys can there be anyway? This time, I am on a trip with my brand new husband. We decide to go ride horses. No more mountains though, this was a coastal beach situation. Yes, firmly on the ground hooves. The sand, the wind, and even the gentle gallop was great - until - the horse got in the mood for some horse-trot. My feet came off the sitrrups and I let go and fell onto the soft sand. A few moments later, the other horses came around since mine overtook them sans rider. I felt just fine. Later, i developed a nausea and we went to the doctor where we found I was pregnant. I suppose my baby and I fell off a horse. This time, I confront the horse I referred to years earlier. The nameless horse in Jeremiah that represents the trepidation and trials of a life of faith. With Pastor Eugene Peterson's help, I dig even deeper for a full, abundant life of faith-full responding to God. These words came as a rebuke to a prophet who felt all ready to give up. 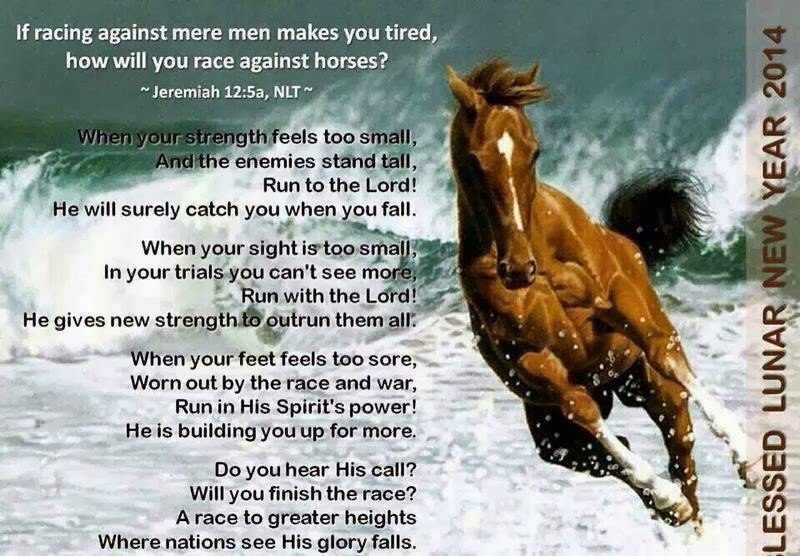 I wasn't at that point when I read Run with the Horses, but it came soon enough -- and God had prepared my soul for the onslaught by drawing me to long for what is deeper and more solid. I had to go say it, "it's the year of the horse, let's do something with horses!". The now older hubs thought it a brilliant stroke and so we all went to The Riders Loft and pulled on some boots and helmets. My horse was a good fourteen hands tall. I cannot look over it at all. When I mounted Galvin, I wanted to get off even quicker. But my daughter and son were next in line to mount theirs so I breathed deep and psyched myself that my fear of heights cannot possibly apply to this. "Mind over matter - what you don't mind, won't matter"; I silenced my fears.We rode around the sand pit a few times each and the trainer applauded us all when we were done. Nay, my horse encounters are not over yet.